It’s a dirty word, but here’s the general state of copyright when it comes to material on my blog. All my maps, except where indicated otherwise, are protected by international Copyright law. They are copyright 2008-2015 by Dyson Logos. Some maps are owned by others – maps I didn’t draw are not my copyright, and maps that I have sold exclusive licensing or ownership to are in their copyright instead of my own. However, those maps that are under my copyright are available for your use under a limited non-commercial license. The License: You can have a non-exclusive, non-commercial license to use my maps in a manner that does not support your other commercial endeavours. Maps licensed in this way can be used on your blog, forums or other online media as long as you include full credit for the cartography to Dyson Logos, and also include a link to this blog. You cannot use this license to publish the maps in a commercial product (including free products that support a commercial product of yours – so if you are selling an RPG, you can’t use my maps for free adventures for said RPG). Nor do you have license to release the map under another license (such as releasing the map specifically under the OGL as Open Game Content, or making it CC-licensed such as for the One Page Dungeon Contest). If you are unsure about the license regarding your own use, or are unsure if a particular map is available under this license, feel free to contact me for more information. A number of maps on the blog are, however, released under a free commercial license. I try to maintain an active list of which maps are available under this license (but may fall behind from time to time). 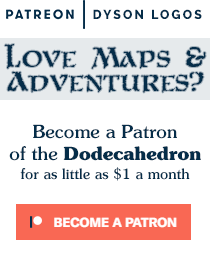 These particular maps are available to you for free for personal and commercial use thanks to the awesome patrons of the Dodecahedron Patreon Campaign. You can use, reuse, remix and/or modify the maps that are being published under the commercial license on a royalty-free basis as long as they include attribution (“Cartography by Dyson Logos” or “Maps by Dyson Logos”). Again, this shouldn’t need repeating, but this only applies to those maps specifically released under this license, and not to the maps on the blog in general. And it applies to the MAPS, not to the associated stories and writing that is published to the blog along with the map. If the name of the map is included on the map proper, then the name is also available under this license. Limited license is provided to use my map geomorphs in non-commercial material such as blogs and free dungeons and other downloadable content as long as there is no charge for this content. You may modify the geomorphs for such purposes as you wish, adding or subtracting features and items from the geomorphs to suit your needs. However, this license specifically prohibits releasing these geomorphs as a similar geomorph product – you can use the geomorphs to make a dungeon and release that, but you cannot just repackage them as geomorphs or “dungeon building blocks” or similar items. You must credit me (Dyson Logos) with the creation of the geomorphs, along with a link to my blog. While I encourage you to take my maps and use them for your non-commercial uses including posting them to your blogs, my adventures are 100% under my copyright. So if you want to modify or reformat one of my adventures for your own use, that’s totally cool, but they cannot be republished in this edited / reformatted format. In other words: If you want a version of one of my adventures in PocketMod format, or re-statted for use with GURPS Magic or another system, go ahead and do it but do NOT post it to the internet, to your blog, or wherever else. If you have a book where my adventures have material released under the terms of the OGL, you will note that the adventure title remains Product Identity, as do the maps. So if you want to use the OGL to republish my adventures, then be sure to include a new map and title. You are free to download and use my character sheets. You are also obviously free to modify them for your own use. However, I retain copyright to the art involved in those character sheets and you are not free to redistribute these sheets or your modified versions of these sheets. If you want to use my sheets as the basis for a new sheet, you are invited to contact me to discuss this. In the past we’ve seen some sweet remixes of my sheets for 4th edition D&D and some foreign language editions – so I’m open to such but again request that you seek permission before distributing my work under your name. Licensing for the use of my maps and adventures in commercial products is available. If you would like to discuss such licensing, please contact me at your convenience. I feel that you are being very generous in allowing us to use your maps/adventures for our personal use . . . and that any other use should be paid for. They are your creations and rightly should remain yours. I salute your talents and am grateful for the generosity that you allow us to share (to a limited extent) the fruits of your talent.